I have an old antenna up on the roof. It works really well but it sure does move when the wind blows. Should I get another antenna or just not worry about it? As much as I would like to sell this person another antenna, the truth is that antennas can sway a lot and still work just fine. You’ll find that a lot of antennas from the 1960s and 1970s are still up there and still working, despite being mounted on 1″ masts which allow them to move a lot when the wind blows. I told this customer that he might want to replace the mast with something a bit beefier but otherwise, he should be fine unless the antenna’s in danger of falling down. Antennas are actually designed to let you aim them pretty badly. Most antennas can be up to 30 or 40 degrees away from the point they should be aimed toward, and 10 or 15 degrees off axis. They’re designed this way. The television signals themselves are relatively strong (compared to satellite.) The waves are also pretty big (again, compared to satellite.) That means your antenna will work quite well even if it’s not aimed straight at the towers. On the other hand, satellite dishes must be aimed precisely. The physics tell the story here. The “beam width” of a satellite antenna is about one half of one degree. That’s how far off aim the dish can be without losing massive signal. This is due partially to the extremely weak satellite signal. After all, it’s come 22,000 miles to get to your house and it gets weaker with every mile. It’s also due to the frequencies used by satellite. While a TV signal can be 3 feet long in each wave the wavelength of a satellite signal is measured in fractions of an inch. When you’ve spent enough time aiming satellite dishes, aiming an antenna seems like a pleasure cruise. Should you replace the mast? In general my feeling is with antennas, that you shouldn’t touch a working setup. If you feel like you could get more channels, that’s great. But there are plenty of people who use 50 year old roof-mounted antennas that still work very well. In a way I wish they didn’t. I’d love to sell antennas to those people. But if you have a working setup there’s no reason to change it. However, Let’s say that you see noticeable movement on a windy day. Maybe you’re worried that the antenna might snap off or fall over. In that case it might be time to take a look at it. Many people don’t need those massive antennas anymore, even with the new FCC “repack.” A much smaller antenna could do just as well. 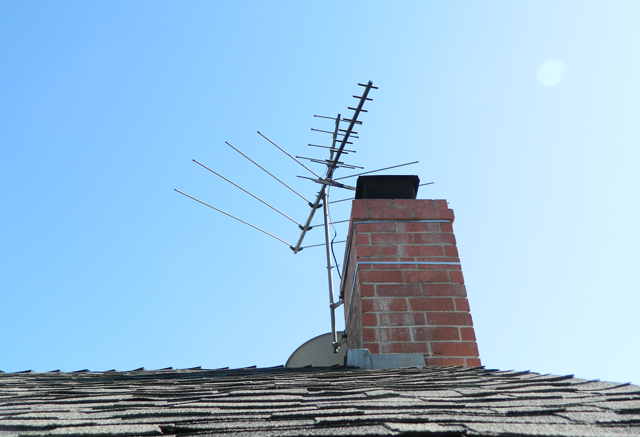 If you have an antenna strapped to your chimney, you can try mounting a smaller, lighter one and seeing if the mast will take it. If not, you can replace the mast and still use the same chimney mount. You may need to soak it in WD-40 or something like that first, because it’s probably been up there for a while. I won’t ever recommend that someone replace something that works well, but if you do need a new antenna or mast, I hope you’ll consider shopping at Solid Signal. There’s no better place to get all the parts and accessories you’ll need, plus tons of free tech support! If you can’t put up the antenna you want… is it still worth it?